Hansel and Gretel Gives You Communion…Wedding…And Baptism! Communion, weddings, and baptisms are special at Hansel & Gretel. From January to May we feature a full line of beautiful communion dresses, by some of the top designers in the business including, Us Angels, Pierson, Christie Helene, Lauren Madison, and others. We travel to market in NY, PA, and NJ to select the best and latest styles at the best prices. Sizes range from 6 to 12x with special orders available. Our selection for girls also includes, veils and headpieces, shoes, socks, tights, long and short gloves, sweaters, shrugs, purses, slips, jewelry, and gifts. For boys we carry white suits, navy suits, navy blazers, dress shirts, slacks in white, khaki, and charcoal, white shoes, loafers, socks, ties, and belts. Truly we offer you “one stop” shopping for all your communion needs. Our experienced staff will help you get the right fit and help you make this “Special Day” a stress free experience. Year round we carry a large selection of christening outfits for boys and girls. and many others made just for us. We work really hard to find boys rompers and long gowns. Accessories include, bibs, blankets, shoes, socks, tights, and gifts. We carry the Mademe Alexander christening doll, Gund musical christening toys, and christening jewelry. We also embroider names, dates, or anything else you would like on clothing, blankets, bibs, and other items. Embroidering can usually be done within 2 – 4 days. 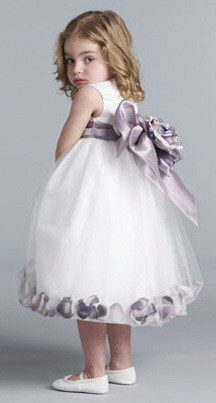 We make your job especially easy for Flower Girls. We have all size ranges in stock to try on for size, and we order the dress of your choice in white or ivory with sashes and flowers. We have swatches in the store for you to chose from, coming in 10 – 15 different colors. We have head pieces, bows, headbands, adorable ballet shoes, and mary janes. For boys we have eton suits, 5pc suits, and tuxes all starting at 12 months. We also carry saddle shoes, black dress shoes, and loafers. Let us make it easy for your “ Big Day”. We provide “one stop shopping” and carry many hard to find items. Now is the time, come see what all the exc itement is about! We’re a true boutique – our clothing is unique. She’s right, not many boutiques are left. We’ve been here 45 years servin not one, not two, but now three generations of loyal customers. Next Story → Buyers Beware…with the times being what they are, the scam artist are coming out of the wood work.